When it comes to working out your chest, you don’t need expensive barbells or even dumbbells. All you need for a comprehensive chest routine is a resistance band. These portable pieces of equipment are both affordable and portable, so you can even take it on the road when you travel. Before you buy one, try it out — the tension level should be right for your level of fitness. When the chest moves become too easy, upgrade to a tighter band. 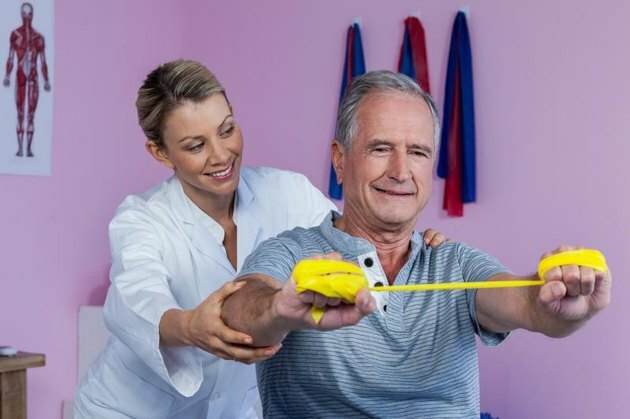 Read More: Are Resistance Bands Effective? If you can do a standard push-up, make it a little harder by adding a resistance band. After you get into the traditional push-up starting position, all you have to do is wrap the band around your back, pulling it in with your hand so there’s an appropriate level of resistance. Then, lower yourself down and push back up, feeling the difficulty increased by the presence of the resistance band. Remember, keep your body in a straight line from shoulders to ankles, rather than letting your glutes push up or sag down. Find a sturdy object that's at chest height, such as a pole or a door handle, and loop the band around it. Turn around so your back is facing the object, and grab a handle in each hand. Step forward until the band is tight and your hands are at your chest. Push the handles forward until your arms are almost straight, but your elbows aren't locked. Return to the starting position to complete one rep. Variation: Lunge forward and push the handles of the band upward or downward to do incline and decline chest presses, respectively. This hits different parts of the chest muscles. 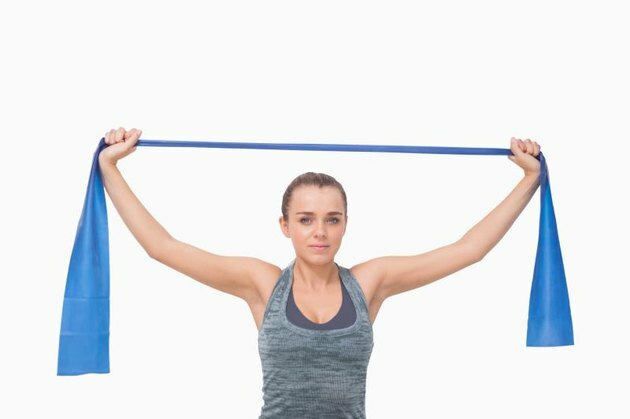 Read More: Can You Get Bigger Muscles with Resistance Bands? Keep that resistance band looped around that sturdy object. Take a few steps forward and lift your arms so so they're nearly parallel to the body — but don't lock your arms. There should be some tension in the band. Bring the arms forward so the handles of the resistance band hands touch — imagine that you're hugging someone and touching the handles behind their back. Return to the starting position to complete one rep.
Variations: Like chest presses, you can bring the resistance bands upward or downward to complete incline and decline chest flyes. Today: 5 simple resistance-band moves for lean muscle: Work your whole body! You've Completed the Push-Up Challenge! Now What?